Two different storms are set to create hazardous travel conditions for those heading home after the holiday weekend in the central and eastern parts of the country. (NEW YORK) — Two different storms are set to create hazardous travel conditions for those heading home after the holiday weekend in the central and eastern parts of the country. 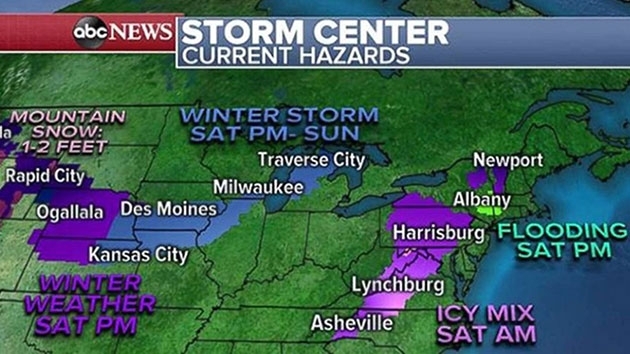 The first worry is a storm expected to quickly race up the East Coast, bringing both ice and flooding threats. The second concern is a developing winter storm in the central U.S. for Sunday that could deliver near-blizzard conditions on a busy travel day. This storm is bringing widespread precipitation Saturday morning from Minnesota to the Carolinas. The immediate concern is that some of the precipitation will be either freezing rain or an icy mix in the Appalachians, from western North Carolina through western Maryland. This precipitation is moving north and east, and the icy mix will spread into parts of Pennsylvania and southern New York later Saturday morning. Temperatures on Saturday morning are near freezing in places such as Boone, North Carolina; Roanoke, Virginia; and Hagerstown, Maryland. This can be a particularly dangerous situation because roads will appear wet, but actually be covered in ice. The threat for icy conditions will wind down late in the morning as the region warms up. Meanwhile, a coastal low will become stronger during the day on Saturday and rapidly spread heavy rain toward the Northeast. Heavy rainfall and possible flooding will spread toward the major Interstate 95 cities Saturday night and into early Sunday. Rainfall is expected to be between 1 and 2 inches in northern New Jersey, southern New York, Connecticut and Massachusetts. By Sunday morning, the coastal low will bring heavy rain to parts of New England. As the storm intensifies, it’ll also bring the chance of some coastal flooding, especially along parts of Massachusetts. The storm should be gone by late Sunday morning. A new storm will develop in the central Plains on Saturday night, taking snow to parts of Kansas, Nebraska and Iowa by Sunday morning. That storm should quickly race toward the north and east, hitting southern Wisconsin and most of Illinois and Michigan by Sunday afternoon. Snowfall totals will mostly be between 3 and 6 inches from northeast Kansas to Michigan. It appears the heavy snow and gusty winds will likely hit Chicago on Sunday afternoon during the very busy travel day. This could cause flight delays and cancellations, as well as dangerous driving conditions. The National Safety Council projects that 433 people may be killed and another 49,400 may be seriously injured in car crashes over the Thanksgiving holiday. In 2017, Thanksgiving was the second-deadliest holiday on the roads, trailing only the Fourth of July, the safety council said. By Monday morning, the storm should move toward the Northeast — where, because of warmer air, most cities will only see rain. But some snow is possible in upstate New York and northern New England. Strong winds are also likely, with gusts of 30 to 40 mph bringing near-whiteout conditions in some parts. It will be extremely hazardous to travel in parts of the region on Sunday, especially on affected parts of I-35, I-80 and I-57. But the storm is moving very fast, which should limit snowfall totals and improve conditions by Sunday night.